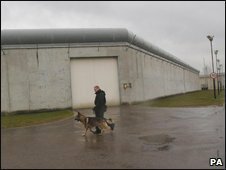 Work on a new young offenders institution in the grounds of Belmarsh Prison, south London, was suspended after a bomb scare. Police were called on Tuesday afternoon to what will be HMP Isis in Thamesmead. Contractors clearing the site had discovered what they thought was a World War Two unexploded bomb. It was found to be an empty shell casing. HMP Isis is being built on the site of the Woolwich Arsenal, which manufactured shells during the war. Thomas McDonald, senior officer at HMP Belmarsh, said: "As they were clearing the site they found the bomb, which turned out to be an old shell with nothing in it. "The police were called and sealed off the area - then they said it was just the body. They are digging up all sorts of old ordnance." About 80 contractors were removed from the site. Elsewhere, a suspected unexploded German bomb was discovered at Michael Faraday School in Walworth, south London. The area was evacuated until bomb disposal experts confirmed it was no longer dangerous.